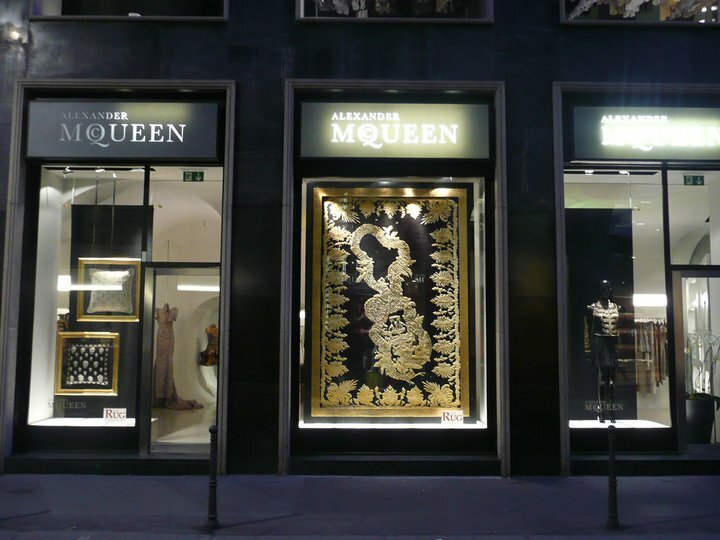 Quietly last Fall, Alexander McQueen, the brand, introduced a line of rugs and home accessories, in collaboration with The Rug Company. 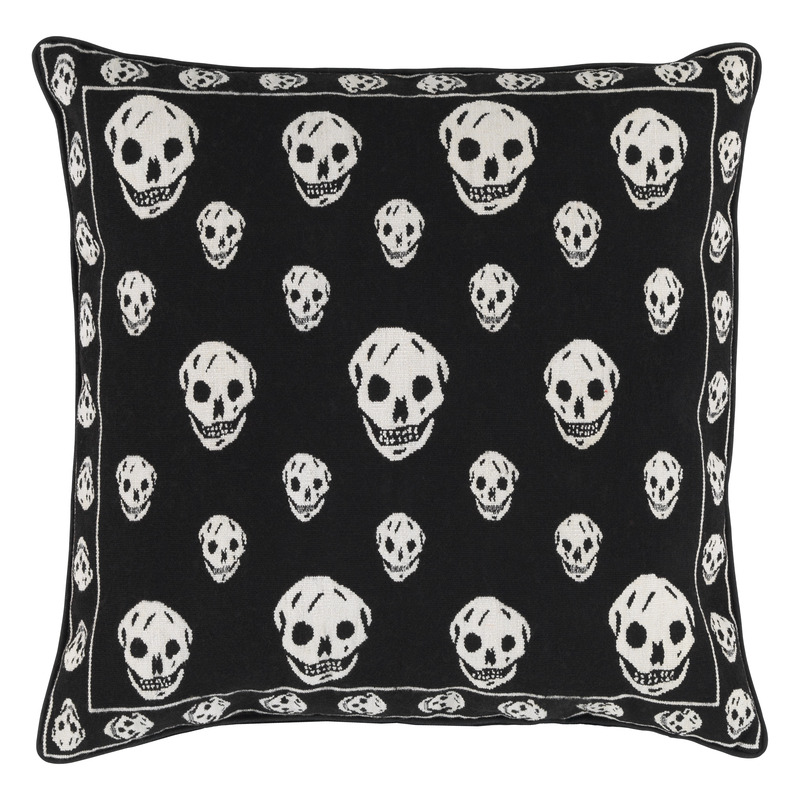 No stranger to designer collaborations, the UK-based home decor mecca has worked with Paul Smith, Vivienne Westwood and dozens of artists and designers over the years. They know how to do it right. This is not fast fashion for your foyer, my dears. This is divine dressing for the den – and beyond. 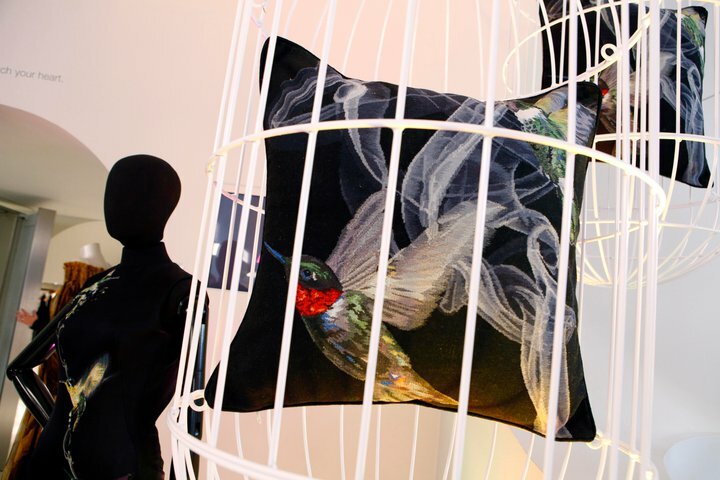 Being a bit of a McQueen dreamer, I fell head over hummingbirds for these designs. The collaboration took three years and the results echo the mastery of McQueen and the level of luxe detail The Rug Company is known for. The carpet couturiers even explored new weaving techniques and spun sumptuous yarns to accommodate the genius of McQueen. 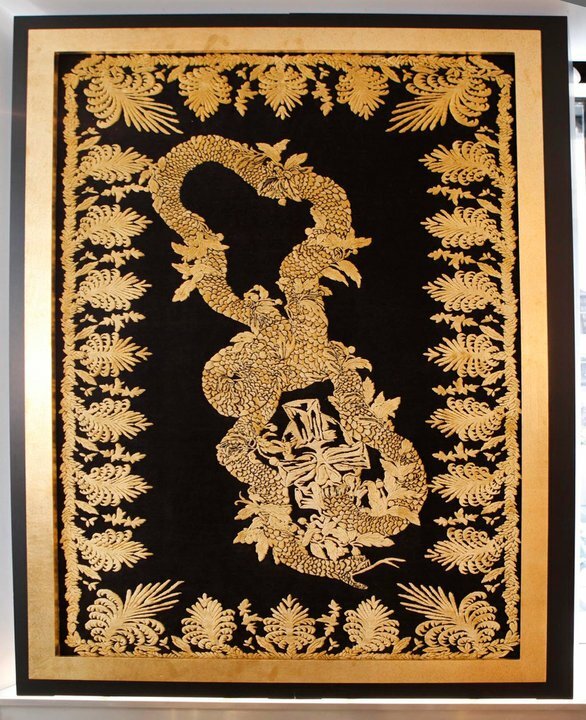 The military brocade rug, for example, incorporates golden silk yarn, raised from the wool background – all of which is carved by hand. Look carefully and you can see that the serpent is wrapped in oak leaves and originates from a skull in the centre of the design and is surrounded by wreaths and ferns. The devil – and the divine – is in the details, my dears. 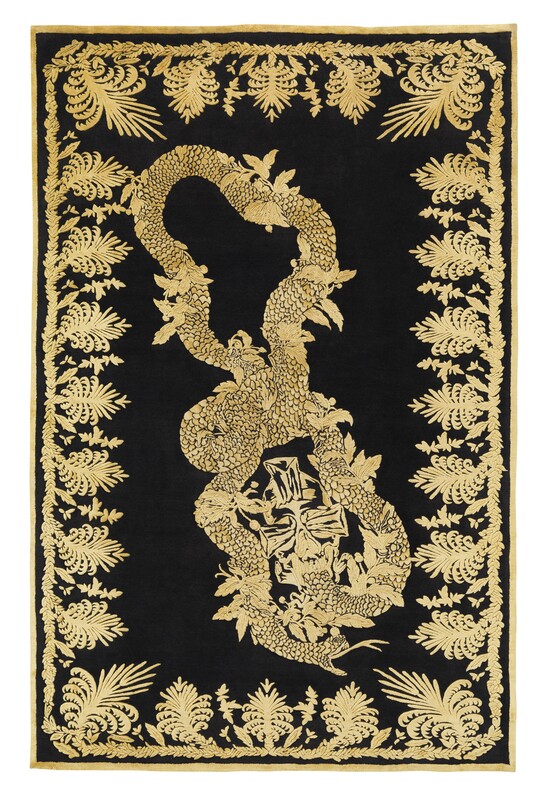 Alexander McQueen military brocade rug: hand-knotted Tibetan wool and raised silk. It raises your consciousness of what a rug can be, no? The design came from a coat from the FW01 collection. The coat that inspired the rug, from Fall Winter 2001. Heart-wrenchingly beautiful. Going back ten years in time to find these images, I am reminded again of how ahead of his time the man truly was. These would still be stand-out pieces today. His clothes are museum-worthy, aren’t they? 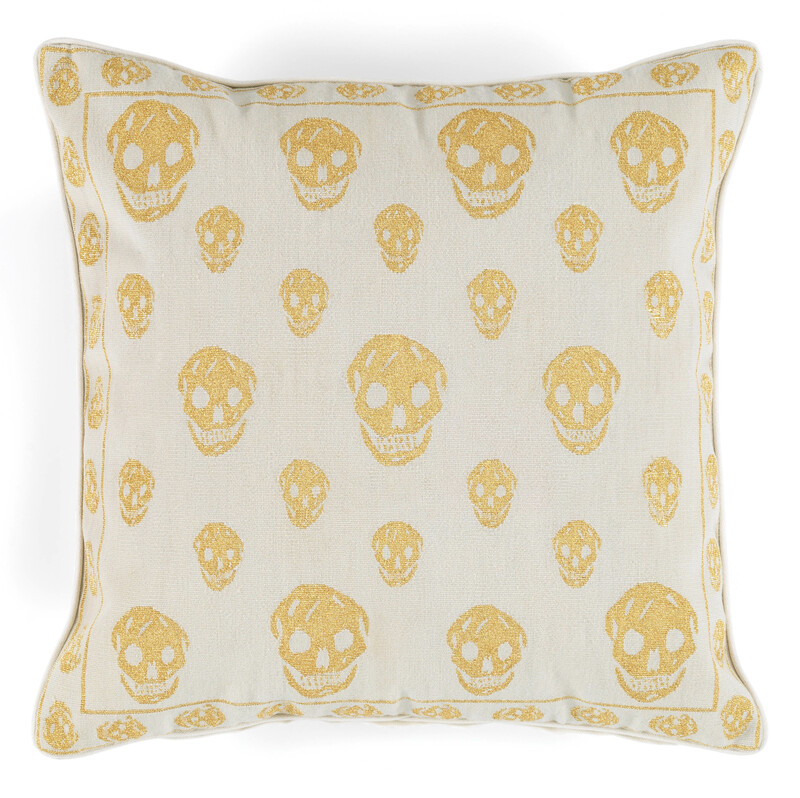 A gold skull “stole” from the FW01 collection. The “stole” above, looks like another piece of wearable art from McQueen mate Shaun Leane. Lee was consistent in his depictions and inspirations. 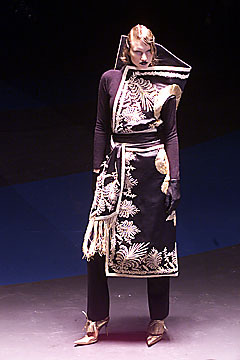 The military brocade design appeared ten years later, in what would be his final collection. The Intarsia wool and silk blend dress from FW10. 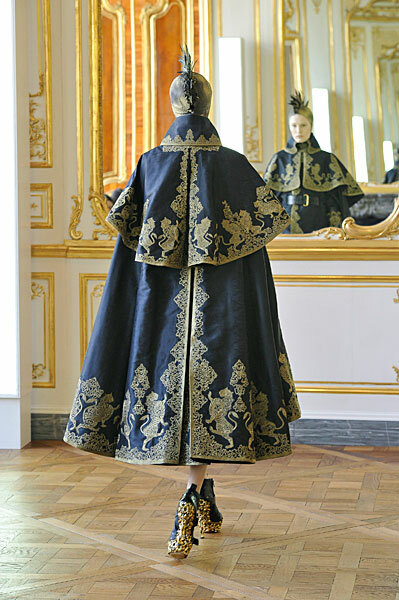 The dress above, is a more wearable interpretation of this glorious caped coat. 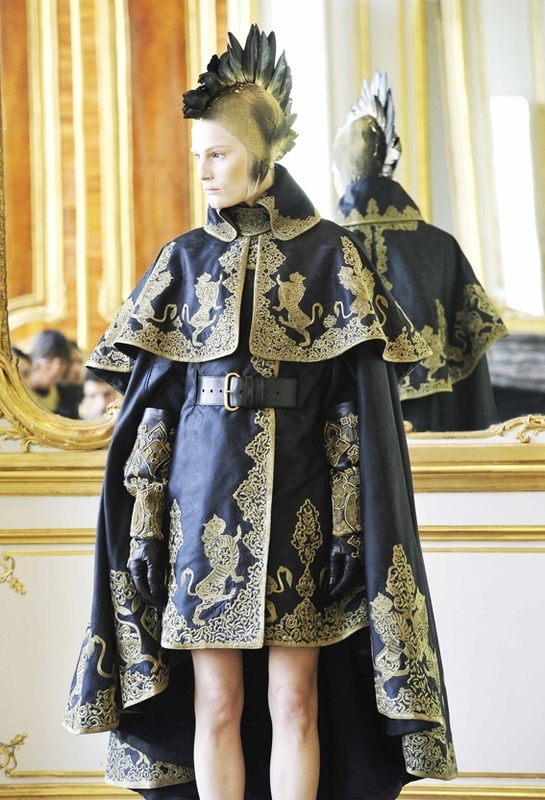 The gilded, caped coat – such darkness and light in one garment. Echoes of the Asian theme still exist, but are intricately woven with western motifs. McQueen often worked in stark contrasts – light and dark; east and west; modernity and tradition; real and surreal. The rug in the window of the Milan boutique. 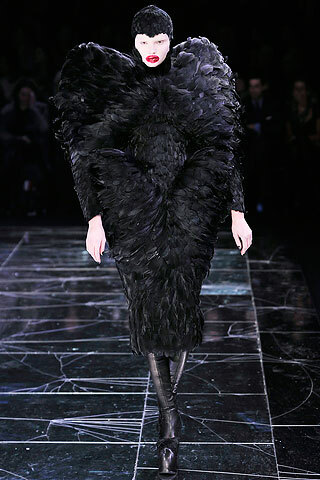 Feathers were another consistent theme for McQueen. They appeared in many forms during his shows over the years – perhaps birds were the inspiration for his frequent flights of fancy. 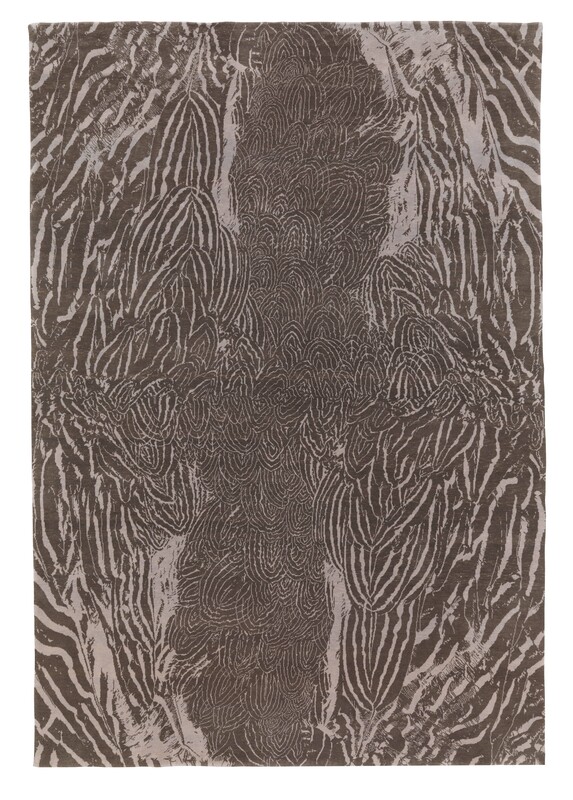 The hand-knotted Turkish cashmere Feathers rug. 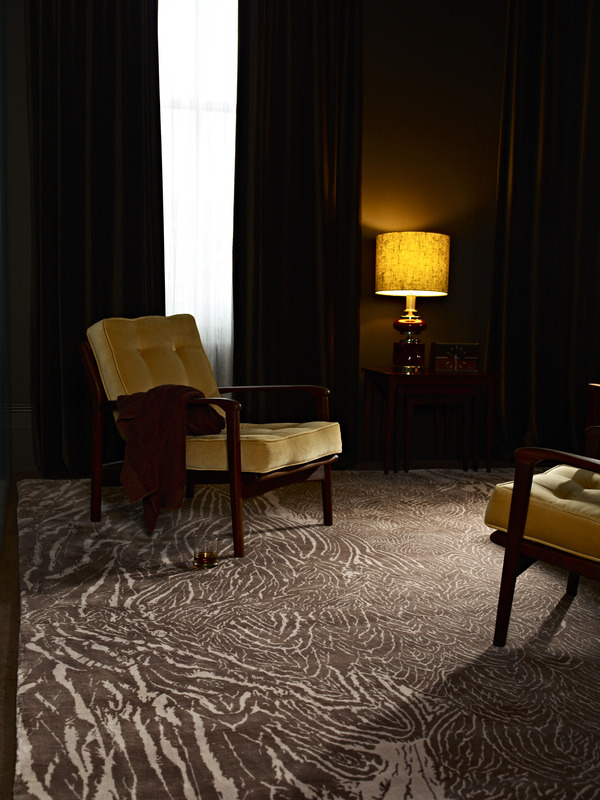 The cashmere yarns used in the rugs were woven to reflect the softness and lightness of the feathers they depict. The softness and lightness of a feather dress, from the Alexander McQueen SS08 show. Is it me, or can you feel the softness of that cashmere through these images? They take you to another world. You are transported. Getting carried away during Voss, SS01. A bodice for a goddess: from FW09. 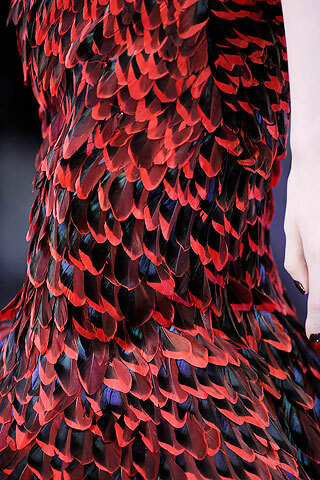 McQueen was inspired by birds of prey and lovebirds, alike. I will never forget his hummingbirds, though. 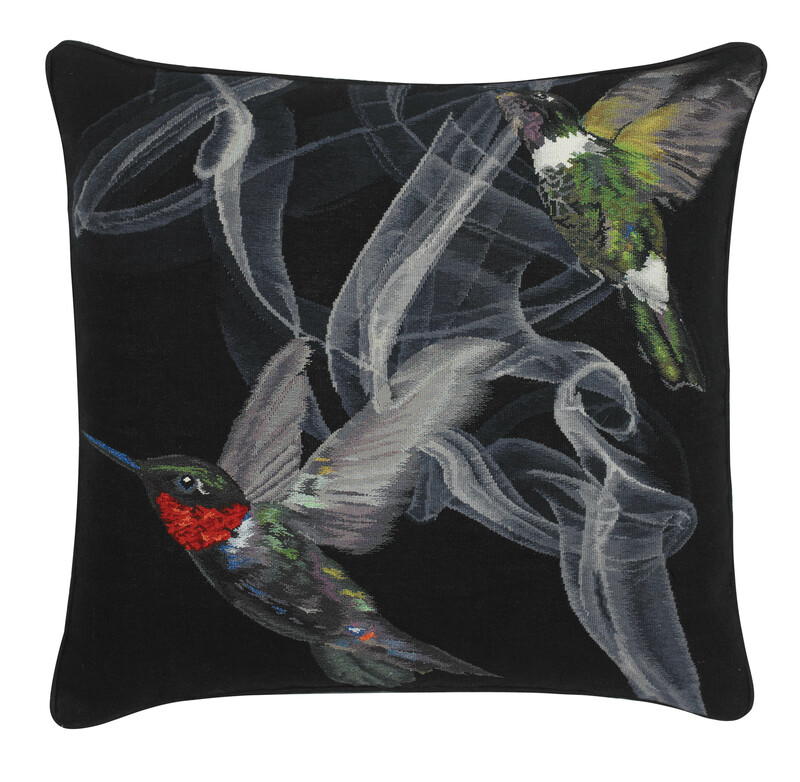 Alexander McQueen for The Rug Company hummingbird cushion, wool and silk aubusson with metallic thread. The history of the term, aubusson dates back to workshops that originated in 1743 in the villages of Aubusson and Felletin, France. These workshops were established to weave pile carpets for nobility and royal residences. The pile-less tapestry technique previously in use in this district was adapted for so many of the carpets, that the word Aubusson has become synonymous with a flat-woven French tapestry or carpet. I saw many of these on a visit to the South of France more than a decade ago. I’ll never forget that artisan, nor his stone-walled cave workshop. 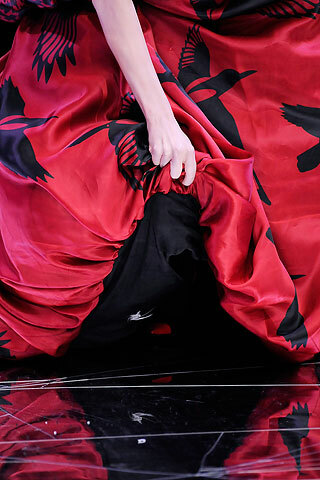 The Edgar Allan Poe-try of a dress: FW09 McQueen. 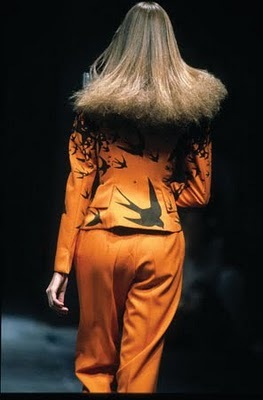 Alexander McQueen suit from The Birds SS95 – one of his earliest runway shows. But like I said, it’s the hummingbirds that have me singing a consistent tune. While the bulk of the collection was launched last October, designs like this one, have only become available recently. 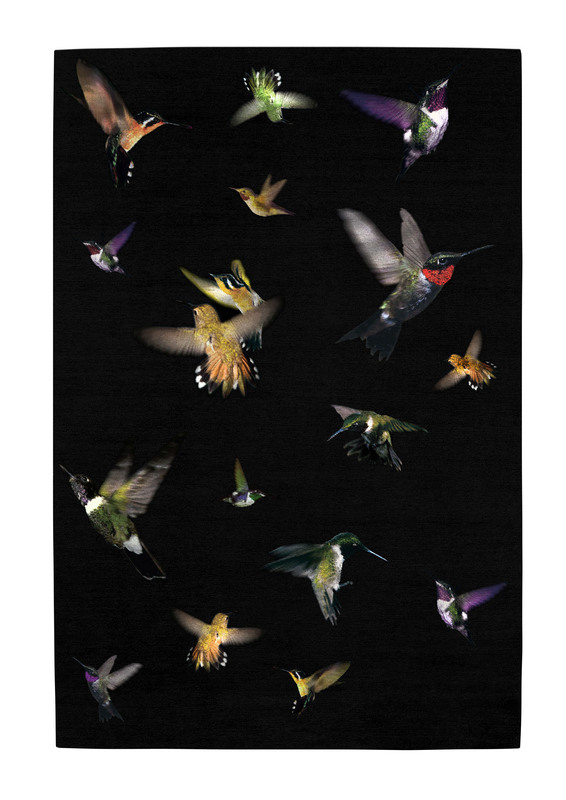 Alexander McQueen hummingbird rug for The Rug Company: hand-knotted cashmere and silk. 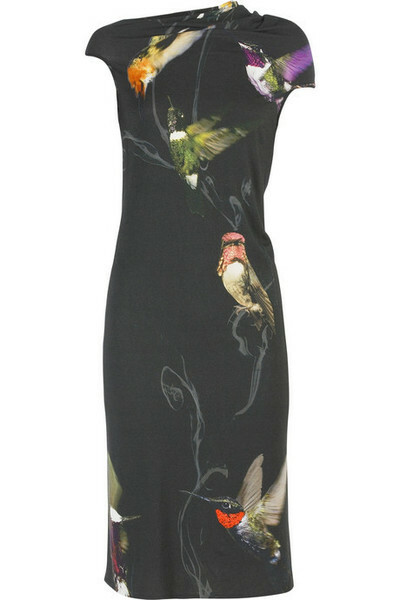 One of my fave McQueen pieces of all time – the hummingbird dress. McQueen’s designs were always so cerebral – so it was fitting (and it fits so well!) that the man almost single-handedly had the world adorned in skulls. 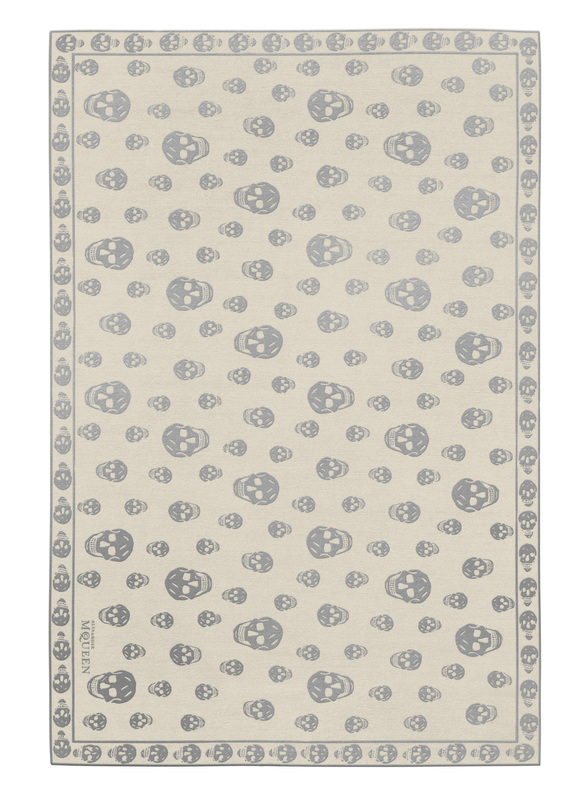 The rug of skulls: hand-knotted Tibetan wool and silk. 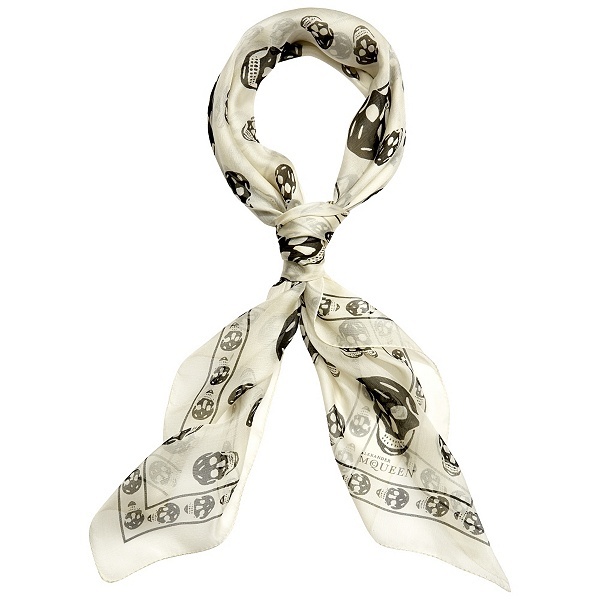 The infamous McQueen skull scarf, copied the world over. 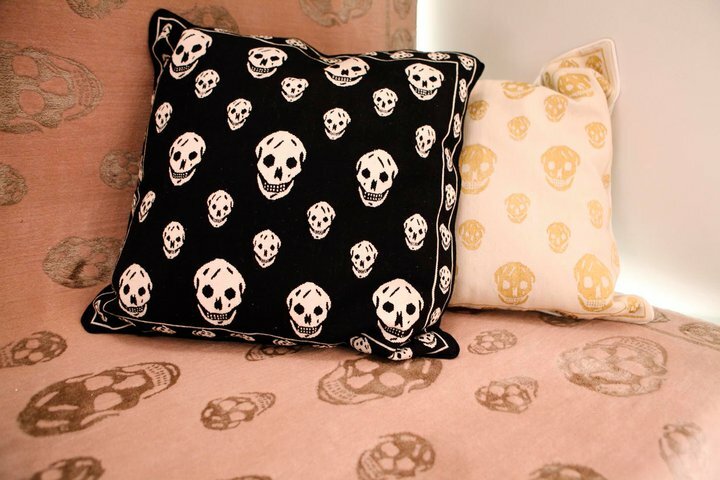 The skulls made a memorable appearance on Ms. Moss. Kate Moss, being, well, Kate Moss during the SS04 show. She wore the same dress (and other notable ones from the past) for the May 2011 issue of Harper’s Bazaar. Kate Moss in the May 2011 issue of Harper’s Bazaar wearing the skull gown. In that issue, Moss remembers her friend Lee, along with close compatriots Annabelle Neilson and Ms. Guinness. How any of us will ever forget him, I cannot know. 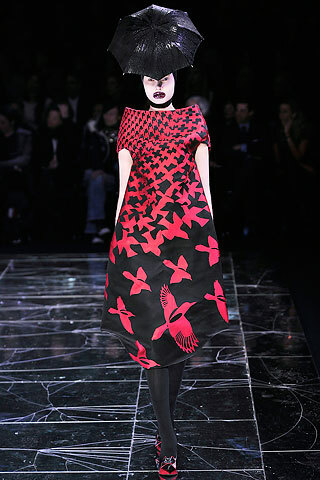 One way to never forget, is to surround yourself in McQueen’s mastery, any way you can. The rugs range from $4K to a soaring (think hummingbirds) $72K CAD, while the cushions are between $750 – $1K CAD. 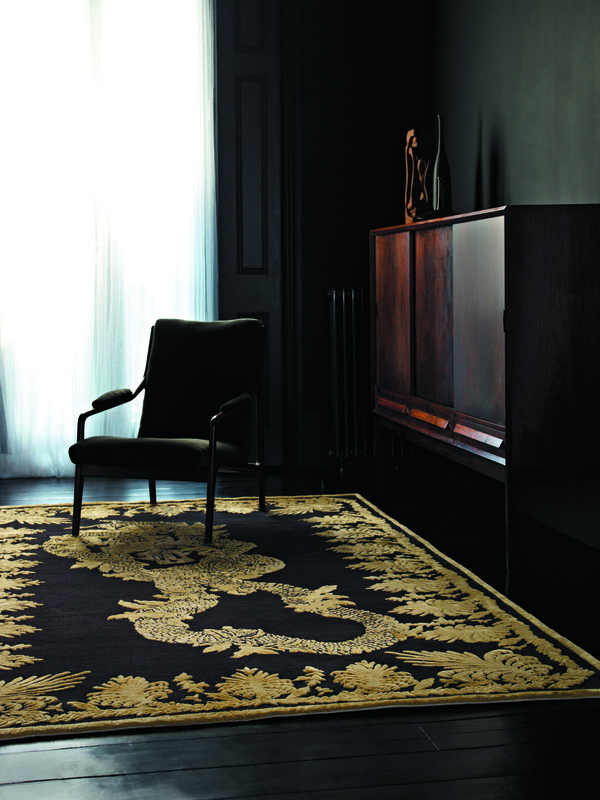 All are available at Avenue Road, the exclusive distributor for The Rug Company in Canada. 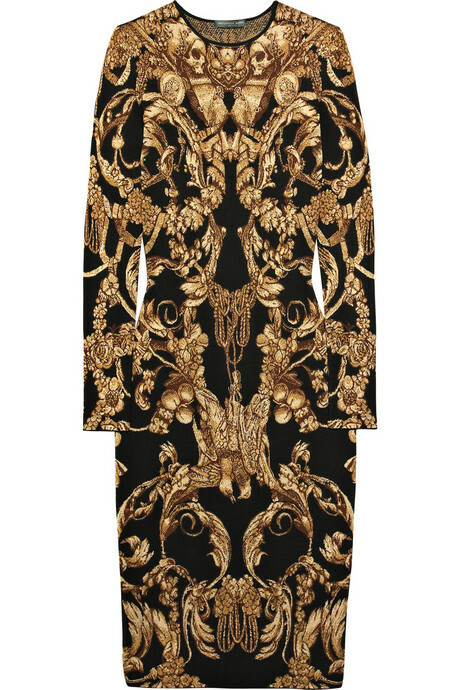 Why limit McQueen’s genius to your closet – when your condo, too can be dressed in couture? Images: All fashion show images courtesy of Style.com except for Intarsia dress which is from Netaporter.com; Harper’s Bazaar image courtesy of TFS; all rug and pillow images courtesy of Avenue Road and Alexander McQueen.